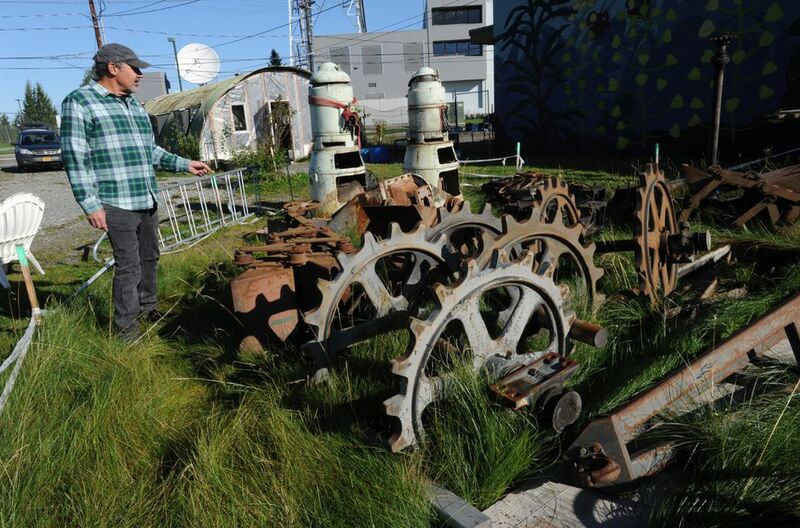 It wasn't all that long ago that the two-acre lot at the very center of Anchorage's Government Hill neighborhood was overgrown with weeds and scarred by a dilapidated, abandoned inn. Now, an orchard of fruit trees grows there. 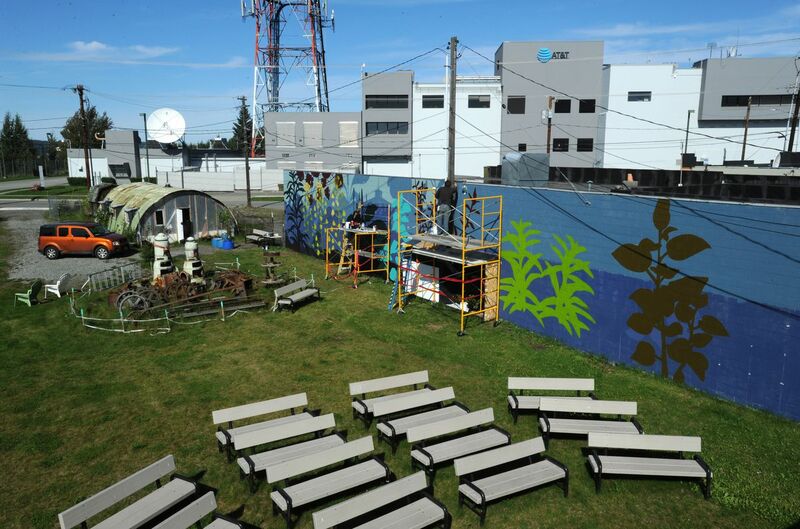 A mural is taking shape on a 100-foot wall. Benches that once occupied the Anchorage downtown transit center, which was largely closed this year for redevelopment, are now set up at the south end of the property for special events. A historic Quonset hut with a mottled-green roof, once leaky and abandoned, has been converted into a workshop and storage shed. For the past two years, land that was supposed to be dug up to make way for the now-defunct Knik Arm bridge project is evolving into a green neighborhood center. "It's quite a transformation," said Steve Gerlek, a longtime Government Hill resident and retired BP project manager who spearheaded the orchard and gathering space now known as the "Government Hill Commons." 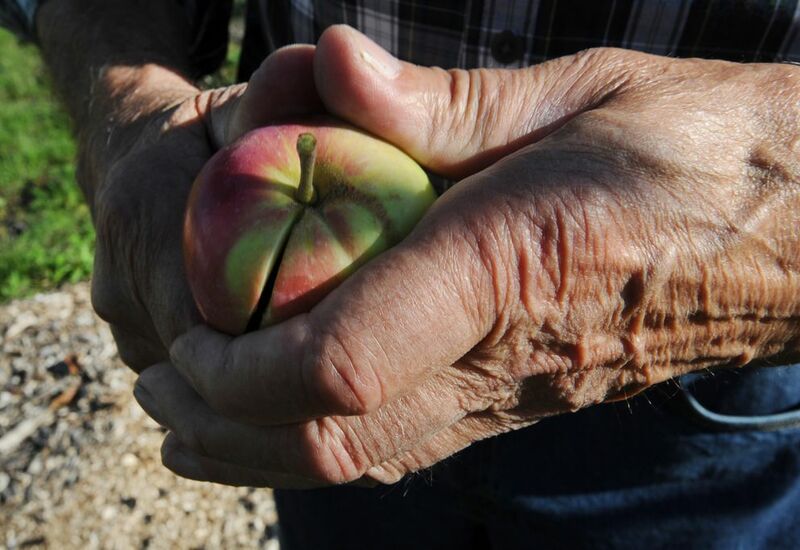 On a recent morning, Gerlek and Paul Lariviere walked among the rows of fruit trees. Lariviere picked a crabapple from one of the branches and took out a knife, slicing in to check its ripeness. 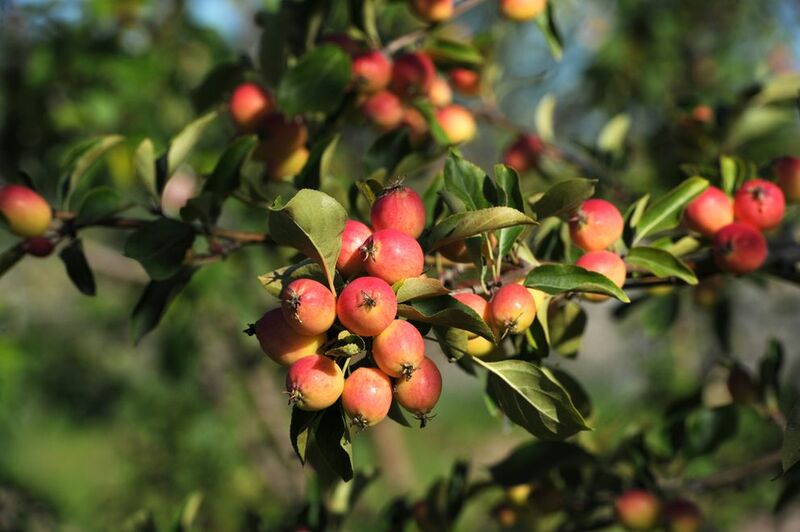 Lariviere, a South Addition apple tree grower, has become the appointed "orchard master" of the new Commons. He's been crafting bamboo sticks, wood and wire to shape the fruit trees into fans, candelabras and even a heart. 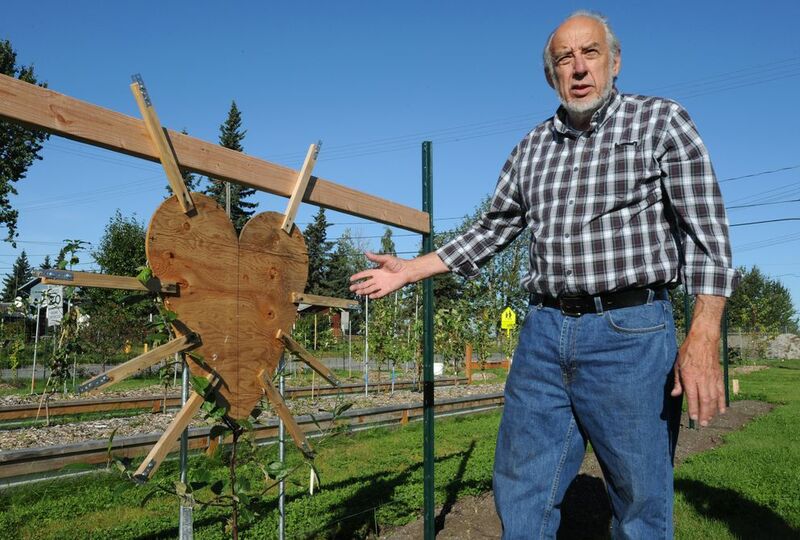 Lariviere has a cider press at his home in South Addition and an apple tree in his backyard. But he'd run out of space to experiment when Gerlek approached him about the Government Hill orchard. Now Lariviere and his dog, an elderly collie named Gidget, can be seen there most days of the week. "My interest is in developing stuff that hasn't grown here before," Lariviere said. Earlier this year, students from the nearby Government Hill Elementary School helped stack firewood and move wood chips. Gerlek said the managers of the Commons are working to get a cider press to use with students during the fall harvest. There are even grander long-term ideas in the works. In a small, empty white building that's been at times a piano store, hobby shop and radio repair business, Gerlek wants to see a neighborhood hub that serves coffee in the morning and food and beer and wine in the afternoon. In 2014, the state of Alaska was still pursuing the construction of the Knik Arm crossing, a bridge between Point MacKenzie and Government Hill. The project involved tearing down buildings to make way for the bridge and its access roads, including a tunnel. One of the demolished buildings was the Sourdough Inn, the former hotel on the site of the current orchard and community space. The state also tore down several houses, which sparked protests and acrimony, but neighbors agreed the inn was an eyesore. The tension led to the discussions about a remediation project, Gerlek said. Today, the Commons is leasing the orchard land from the Alaska Department of Transportation and Public Facilities at no cost. If the bridge ever does become a reality, the trees, and the rest of the operation, can be moved and replanted on top of the tunnel slated to run beneath the site, Gerlek said. The wall with the mural is already out of the path of potential construction. The orchard idea fit into an existing interest in backyard gardening in Government Hill. Cherries and apples already grow throughout the neighborhood, which has a coastal climate and a high elevation suitable for fruit trees. In a community garden, people can reserve garden beds. At the Government Hill orchard, the plan is that people will be able to reserve a tree, and get training on how to care for it, Gerlek said. At the end of the growing season, the tree's caretaker would take half the yield, and the collective will get the other half, Gerlek said. 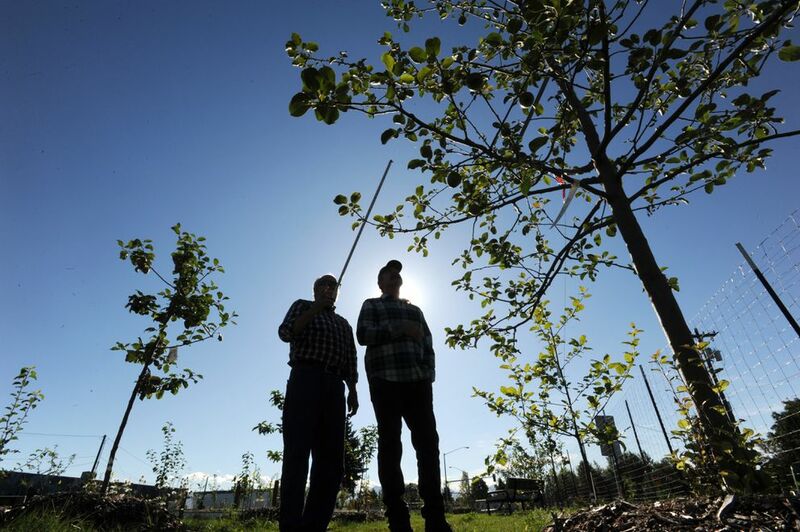 The rent-a-tree model is being tested now with a local company, Double Shovel Cider Co. The business gave a donation to secure the tree, Gerlek said. Gerlek has a theory, modeled after redevelopment in other cities: Put as many things in the area as possible to draw people there. Outside of Government Hill, not many people know much about the neighborhood, said Lyons, the muralist working there. It's not on the way to things, she said, unless you have to go to the military base or to drop off a child at school. 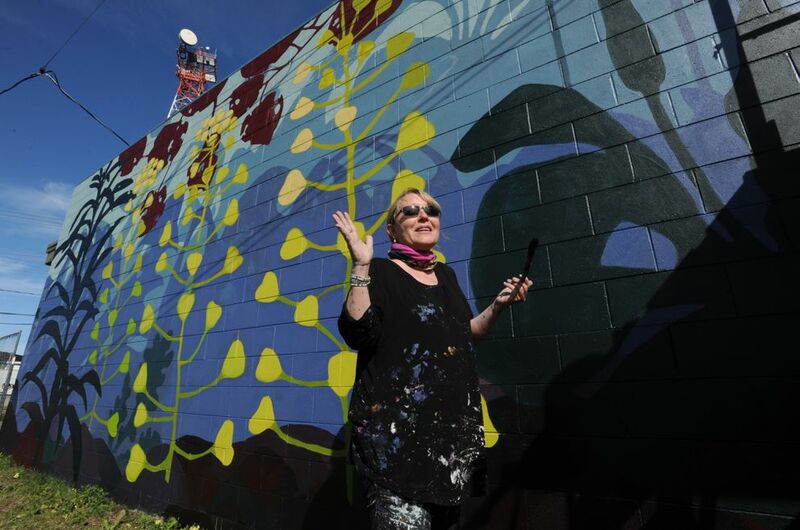 Lyons said she hopes the mural — her largest yet, funded by an Atwood Foundation grant — will become one of those draws. "It becomes a magnet, and things start to grow around it," Lyons said.